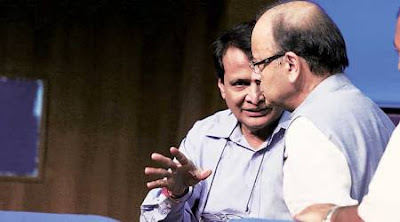 latestnews1947: Finance Minister Arun Jaitley said on Wednesday that Prime Minister Narendra Modi will take a decision on Railway Minister Suresh Prabhu's offer to resign in the wake of railway accidents. "The Prime Minister will take a decision on whatever the request made by Railway Minister," Jaitley said when he was asked about the reported offer by Prabhu to quit after the Saturday train accident in Uttar Pradesh killed 22 people. "Accountability is a good system in government," Jaitley said in response to another query about some officers being reportedly upset over the action taken against their colleagues. Railway Board Chairman A.K. Mittal resigned on Tuesday. On Wednesday, the government named Air India chief Ashwani Lohani as the new Board Chairman. After a meeting with the Prime Minister, Prabhu tweeted: "I met (Modi) taking full moral responsibility. PM has asked me to wait." "I am extremely pained by the unfortunate accidents, injuries to passengers and loss of precious lives. It has caused me deep anguish," Prabhu said.